Jingle Bells, Jingle Bells. The first day for the first of December is Ceremonial Bell. A Level 3 LIGHT Spellcaster with 0 ATK and 1800 DEF that while it is on the field, keeps both player’s hands revealed. Well, I can’t really think of a use for this, to be honest. Knowing what your opponent has is nice, but it is sorta countered as they will also know what you have in your hand. 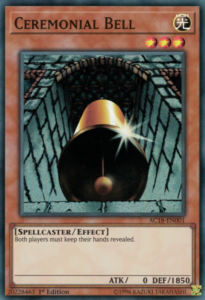 These sleigh bells really give both you and your opponent the gift of knowledge by showing both player’s hands. There might be future use for this, but for now just use this bell to keep jingling away. We all love Christmas songs, right? Awwww… a box of toys. 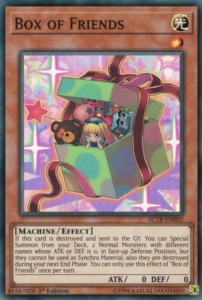 Box of Friends is a Level 1 LIGHT Machine with 0 ATK and DEF and when it is destroyed and sent to the GY, you can Special Summon 2 Normal Monsters from your deck, one with 0 ATK and one with 0 DEF, but they cannot be used as Synchro Material and they are destroyed during your next End Phase. I mean, Christmas Day isn’t as jolly alone, you need pals with you and Box of Friends gets them for you. 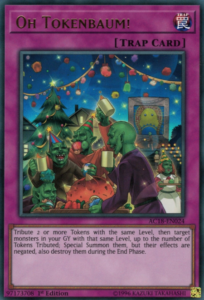 Box of Friends can help bring two Normal Monsters together for an XYZ or Link Summon, and Christmas is all about bringing friends together. Box of Friends is a useful card, which is nice since there are a ton of goodies inside the box. I mean, you can’t celebrate the winter season without a Snowman. 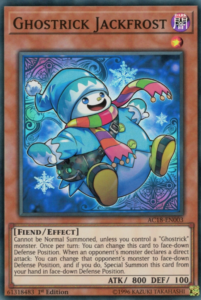 Ghostrick Jackfrost is a Level 1 DARK Fiend with 800 ATK and 100 DEF that cannot be Normal Summoned unless you control a face-up Ghostrick monster, once per turn can be changed to face-down Defense Position, and when a monster your opponent controls declares a direct attack, you can change that monster into face-down Defense Position and Special Summon Jackfrost from your hand in face-down Defense Position. How ironic that a Snowman wants you to snuggle up under a blanket for the winter basically by sending monsters into face-down Defense Position. 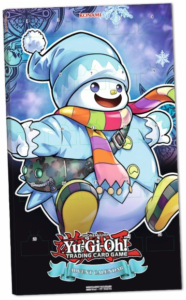 Ghostrick Jackfrost is a solid Battle Hand Trap that is useful to his Ghostrick friends. YETI! 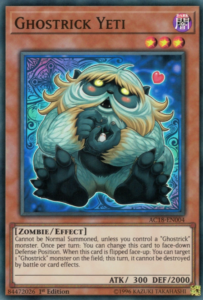 Ghostrick Yeti is a Level 3 DARK Fiend with 300 ATK and 2000 DEF that cannot be Normal Summoned unless you control a Ghostrick monster, can go to face-down Defense Position once per turn, and when flipped face-up lets you target a Ghostrick monster you control and give it protection from battle or effect destruction for the turn. Nice of Ghostrick Yeti to protect his friends during the holiday season. Don’t know how much you’d want to confront a Yeti at any time, let alone during the winter, so I don’t know if Yeti really joins the rest of the Ghostricks in the fun, but they might let him join for the Christmas Season. Getting a little chilly in here. 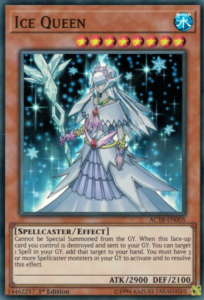 Ice Queen is a Level 8 WATER Spellcaster with 2900 ATK and 2100 DEF that cannot be Special Summoned from the GY and when the face-up Ice Queen you control is destroyed and sent to your GY, you can add 1 Spell back to your hand from the GY but you must have 3+ Spellcasters in the GY to do that. Nice for Ice Queen to get you a gift back before she leaves your field, even though you need setup in your GY, probably to balance the gift out. You got to give before you can get, even on Christmas. I can see this being useful maybe in the future, but for now she will just bring us the snow for the holiday season. Gotta have some Christmas Angels. Tualatin is a Level 8 LIGHT Fairy with 2800 ATK and 2500 DEF and if it is your opponent’s Battle Phase, a monster you controlled at the start of the Battle Phase battled, and all monsters you controlled at the start of the Battle Phase (min. 2) were destroyed in battle and sent to the GY, you can Special Summon this card from your hand, declare an Attribute, and destroy all monsters your opponent controls of the declared Attribute and prevent them from Normal/Special Summoning monsters with said Attribute. An angel sent from the heavens to save you while in danger. The card does seem niche, but it is nice to have a Guardian Angel sometimes, so there’s that. Uhhhhh… New Years is a week after Christmas. 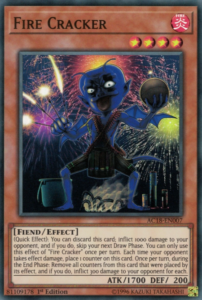 Fire Cracker is a Level 4 FIRE Fiend with 1900 ATK and 200 DEF and you can discard this card during either player’s turn to deal 1000 damage to your opponent at the cost of your next Draw Phase (which is a hard once per turn), and each time your opponent takes damage, place a counter on Fire Cracker and during the End Phase, you can remove all the counters placed on this card by its effect to deal 300 damage to your opponent. Sometimes you want to get the Fireworks off before curfew on New Years and Fire Cracker allows you to do that (in the case of this game during time at a major tournament). Most people like fireworks and Fire Cracker can let you get some Fireworks off before you can’t anymore. More snowmen! 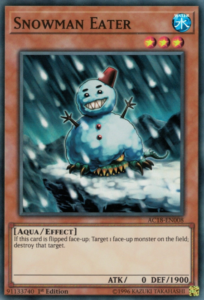 Snowman Eater is a Level 3 WATER Aqua with 0 ATK and 1900 DEF and when it is flipped face-up, it will let you target a face-up monster on the field and destroy it. Wow, Mr. Snowman Eater here doesn’t care if you want the gift of destruction or not, he’s giving it to you anyways. Well, at least he cares enough to try and give you a gift for Christmas. This feels like a gift that would of been cool years ago, but now it is a little late. Sorry Snowman Eater, there are better gifts for the holiday season now. I know it is a toy, but I didn’t know it was Easter. 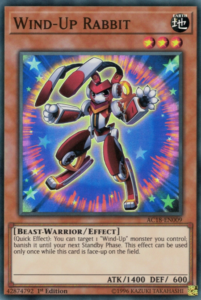 Wind-Up Rabbit is a Level 3 EARTH Beast-Warrior with 1400 ATK and 600 DEF that during either player’s turn, lets you banish a Wind-Up monster you control until the Standby Phase of your next turn and you can only use this effect of Wind-Up Rabbit once while it is face-up on the field. Sometimes you get those Wind-Up toys for Christmas, and Wind-Up Rabbit here lets you wind your toys back up to use again. Very useful card in some instances, worth playing to wind your cards back up, including himself. One of Santa’s Elves is here. Mystical Fairy Elfuria is a Level 3 WIND Spellcaster with 1500 ATK and 900 DEF and she lets you reveal a WIND monster in your hand and until the end of your opponent’s next turn, prevents players from XYZ summoning using monsters with a different level as material. The naughty kids don’t get to play with their toys. Elfuria is good for locking down XYZ decks that rely on certain Ranks, but is locked to WIND decks. That winter breeze really does make things chilly. Consider it in the future. You really want to be around the ones you love on Christmas. 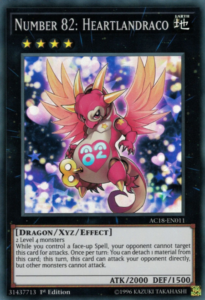 Number 82: Heartlandraco is a Rank 4 EARTH Dragon with 2000 ATK and 1500 DEF and requires 2 Level 4 monsters as material and while you control a face-up Spell, your opponent cannot target this card for attacks and you can detach a material from this card to let Number 82 attack directly for the turn, but other monsters cannot attack. Heartlandraco doesn’t want to be bothered with the ones that don’t love it and will do anything to be near the ones that do. Heartlandraco is still a useful Rank 4 for getting extra damage in, even in 2018. You can’t have Christmas without Santa himself. 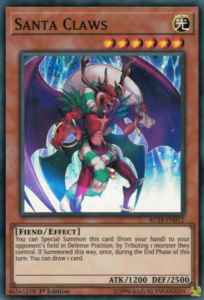 Santa Claws is a Level 6 LIGHT Fiend with 1200 ATK and 2500 DEF and you can Special Summon him from the hand to your opponent’s field by tributing one of their monsters and letting them draw a card during their End Phase. Sometimes you want to give even your worst enemies a gift and Santa Claws does that, but they have to wait for the best gift. Santa Claws is a useful card, but only if there weren’t a bunch of Kaijus that were better. You know Thanksgiving was last month, right? 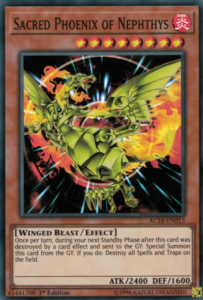 Sacred Phoenix of Nephthys is a Level 8 FIRE Winged-Beast with 2400 ATK and 1600 DEF and if it was destroyed by a card effect, you can revive him from the GY during your next Standby Phase and destroy all Spell/Traps on the field. All Phoenixes rise from the ashes and Sacred Phoenix is no different and it burns some stuff while being revived. All you have to do is destroy this Phoenix, which anyone that knows about the legendary Phoenix will likely not destroy it via a card effect. 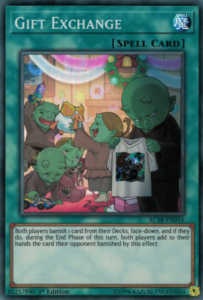 We are getting some of the disciples of the Phoenix soon, so this card is relevant now-a-days. Eh, Christmas Turkey doesn’t sound that bad, or chicken in this case. 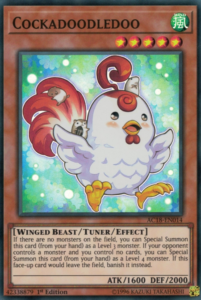 I do believe Japan eats KFC for Christmas, so… Cockadoodledoo is a Level 5 WIND Winged-Beast Tuner with 1600 ATK and 2000 DEF and if there are no monsters on the field, you can Special Summon this card from your hand as a Level 3 monster or if your opponent controls a monster and you control no cards, you can Special Summon this card from your hand as a Level 4 monster, but Cockadoodledoo is always banished when it leaves the field. This chicken really wants to cross the road and let you Synchro Summon, so it gives you two ways to do it. Cockadoodledoo is a useful Tuner monster for several decks, now who wants some KFC? It is finally time to feast. 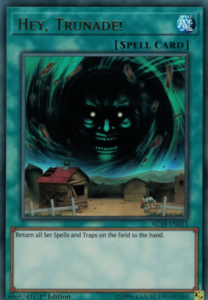 Token Feastevil is a Normal Trap that when activated destroys all Tokens on the field and burns your opponent for 300 damage for each Token destroyed. These poor tokens don’t deserve to get eaten like this, especially on Christmas, and clearly someone is eating too much if they are getting burned for 300 for everything they eat. 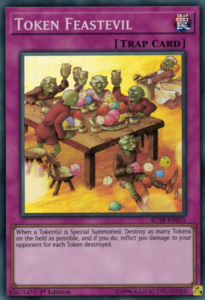 Token Feastevil is useful against those evil token monsters, so you might want to have this on the side to get ready for a feast when need be. You gotta give gifts on Christmas, it’s staple. Gift Exchange is a Normal Spell that lets both player’s banish 1 card from their deck face-down and during the End Phase of the turn, give the card they chose to their opponent. I mean, the idea is nice, giving gifts to your opponent, but considering you are against each other, the odds of you both getting a good gift is very low. Gift Exchange is nice in theory, but sadly I don’t know if anyone will get anything good out of this exchange and I’d just find someone else to exchange gifts with. Also, I feel bad for the guy that got the Scrap Kong shirt, I’d prefer Geargiacceleartor or Madolche Baaple as well. Awwww, a flower, even though it hasn’t bloomed yet it seems. 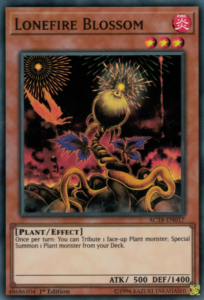 Lonefire Blossom is a Level 3 FIRE Plant with 500 ATK and 1400 DEF and once per turn lets you tribute a Plant you control to Special Summon a Plant from your deck. So letting your young flowers bloom early, how nice. 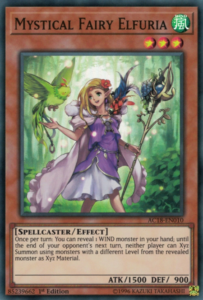 Lonefire Blossom can get you so many good Plants from your deck that I’ve never really seen any Plant deck without this card, you want your Plants to bloom as soon as possible and Lonefire Blossom lets you do that. Get those roses to bloom before Christmas comes, your love might not like a flower that hasn’t bloomed yet. You want a star on top of your Christmas Tree that will shine as bright as possible. 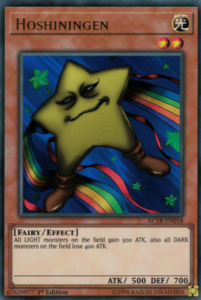 Hoshiningen is a Level 2 LIGHT Fairy with 500 ATK and 700 DEF and it gives all LIGHT monsters 500 ATK and takes away 400 ATK from all DARK monsters. This star is really going to shine bright over all the darkness, the only thing is that there is now a better Christmas Star in Hip Hoshiningen. Sadly, I don’t think anyone will use Hoshiningen for their star in 2018 when there are better options now. This star won’t be shining bright this year. Santa hasn’t forgotten his reindeer. 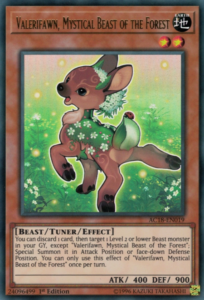 Valeifawn, Mystical Beast of the Forest is a Level 2 EARTH Beast Tuner with 400 ATK and 900 DEF and it lets you discard 1 card to target a Level 2 or lower Beast in your GY that isn’t Valeifawn and Special Summon it in Attack Position or face-down Defense Position. Looks like Valeifawn hasn’t forgotten their reindeer friends either. You got to have reindeer on Christmas, and Valeifawn is a good reindeer. Getting your Beasts back to go into bigger beasts like Naturia Beast. Hopefully Valeifawn isn’t mean to Rudolph like the other reindeer were. Toys are a staple Christmas gift. 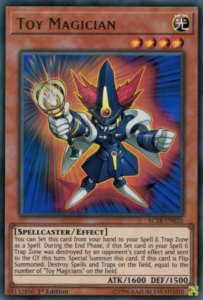 Toy Magician is a Level 4 LIGHT Spellcaster with 1600 ATK and 1500 DEF and it can be set from the hand to the Spell and Trap Zone and when your opponent destroys Toy Magician, you can Special Summon it and if Toy Magician is flip summoned, you can destroy Spells and Traps on the field up to the number of Toy Magicians you control. Toys are better in multiples, not just one. Toy Magician is cool, especially around his other Toys, but sadly we all grow up and now-a-days, we prefer Artifacts over Toys. He’s nice for a toy, but I don’t really prefer toys as I get older unless they are collectable. You gotta make sure you go to sleep on time before Santa arrives. Number 41: Bagooska the Terribly Tired Tapir is a Rank 4 EARTH Fiend with 2100 ATK and 2000 DEF and requires 2 Level 4 monsters as material and once per turn, during your Standby Phase, you must either detach a material from this card or destroy it, and while Bagooska is in Attack Position, it cannot be destroyed by card effects or target it with card effects and while in Defense Position makes all other monsters go to Defense Position and not be able to use their effects while in Defense Position. Bagooska makes sure everyone goes to sleep right on time here, now if only Link Monsters would listen. Bagooska here is also like the parent because you can’t do anything to him really while he is in Attack Position, but it seems he can’t stand being awake for too long, otherwise there are problems. 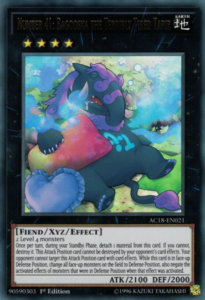 Still, Bagooska is good to have in your Extra Decks to make sure everyone gets their sleep. Winter is really, really cold if you couldn’t guess already. 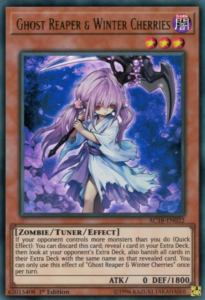 Ghost Reaper & Winter Cherries is a Level 3 DARK Zombie Tuner with 0 ATK and 1800 DEF and during either player’s turn while your opponent controls more monsters than you, you can discard this card to reveal a card in your Extra Deck and banish all monsters in your opponent’s Extra Deck with the same name face-down and this is a hard once per turn effect. Ghost Reaper here really doesn’t like the naughty kids as she completely freezes them solid to where they can’t be used. 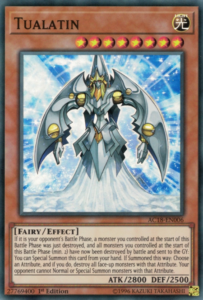 Ghost Reaper is good against many strong Extra Deck monsters to freeze them away for the rest of the duel, worth having on your side. It is almost time to celebrate the most wonderful time of the year, Christmas! Oh Tokenbaum! is a Normal Trap that when activated, lets you tribute two or more Tokens with the same Level to target monsters in your GY with the same Level up to the number of tributed Tokens and Special Summon them, but their effects are negated and they are destroyed during the End Phase. It isn’t common to see high level Tokens, so you are likely reviving low-Level monsters. Also you can use the Tokens for almost anything you could use the revived monsters for unless said Tokens have restrictions, then you’d want the other cards. It’s almost like trading a gift for literally the same thing. Oh well, Merry Christmas!